Customers have many diverse needs and requirements. They want us to coordinate everything from in-process products to bullion recovery, or to source materials in large lots, or to create new products from new materials, or to improve the performance of their own products, or even to achieve drastic cost reductions. 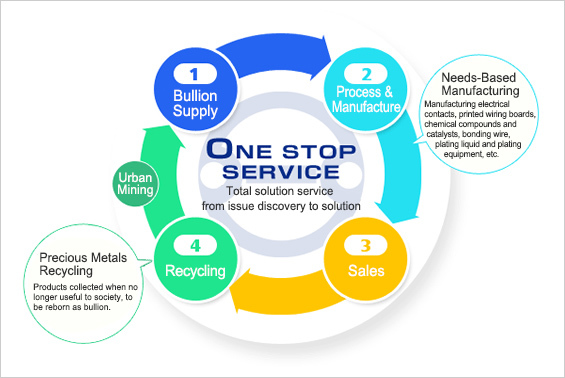 The TANAKA Kikinzoku Group provides a “One Stop Service” for everything about precious metals, from bullion supply to process and manufacture, sales and recycling. Thanks to the supply routes, extensive technological capabilities, solid research systems, product development strengths, and a domestic and international network of facilities that we have built up since the company was established, we provide total support to our customers in solving their issues and making improvements. In 1923, at a time when 70% of the world’s platinum and palladium was being produced in the Soviet Union, TANAKA signed a sole agency contract with them for the sale of platinum and palladium in the Orient. From that time, we have built up strong trade routes in partnership with mining companies and precious metals dealers in each country, which gives us access to the quantities we need when we need them. A collaboration with GFMS* has enabled stable purchasing as a trader with a solid grasp of market information. * From the 1990s, GFMS has been a precious metals market research company publishing the world’s most trusted statistics report on supply and demand for platinum, gold, silver and palladium. In addition to sourcing precious metals from the world’s markets, TANAKA is also diversifying its supply routes into precious metals recycling, or urban mining as it is otherwise known, of asset products, jewelry products and end-of-life industrial products. TANAKA has considerable know-how in unlocking the unlimited potential of precious metals. We support our customers from the development stage, offering solutions in line with their needs and helping commercialize their products. Our great strengths are the know-how and experience built up over many years in many different fields, which combine to create new products. TANAKA provides sales support utilizing the strengths of direct marketing. Wherever you are in the world, TANAKA provides a One Stop Service for precious metals-related products. With 13 overseas facilities in Asia, North America and Europe, etc., we provide multi-lingual support to Japanese and other companies deployed globally. In addition to recycling precious metals from used industrial products, TANAKA is able to recycle precious metals from manufacturing scrap and equipment. We use our abundant experience and technologies to offer solutions that improve the recycling efficiency of expensive precious metals and reduce the costs for our customers. With these cycles, TANAKA is able to offer a total solution service to our customers.